•	Hostas that have leaf variegation in the center need more light/sun than those that have it on the edges. If they don't get it, they are less dense or vigorous than when in more light. Example: Hosta 'Undulata Univittata' (center varigation) compared with Hosta 'Undulata Albomarginata' (edges). 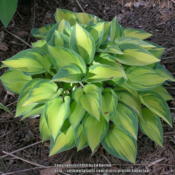 •	Hostas that have gold colors need more light/sun than those that have white colors. An extreme example is Hosta 'June', which is very sensitive to light. My Hosta 'Sun Power' is all gold and really likes the PM sun it gets. •	If you have a hosta that seems thin or lackluster, move it so it is getting more light. My first June was dying (down to 2 leaves!) and in a very shady place (plus being shaded by a tall vase-shaped hosta). My last-ditch effort was to move it. In 4 years it was 10" in diameter. •	Lastly, from "Growing Hostas" (in Learning Library), but included anyway: if hosta leaves are getting dried/brown around the edges, it could be lack of water or too much sun/heat burning them.